To celebrate the publication of Fantastically Great Women who Changed the World, author Kate Pankhurst is here to talk about one of the amazing women discussed in the book, Frida Kahlo. I’d love to visit Frida Kahlo’s Blue House in Mexico. The home where she created many of her gloriously mono-browed portraits. 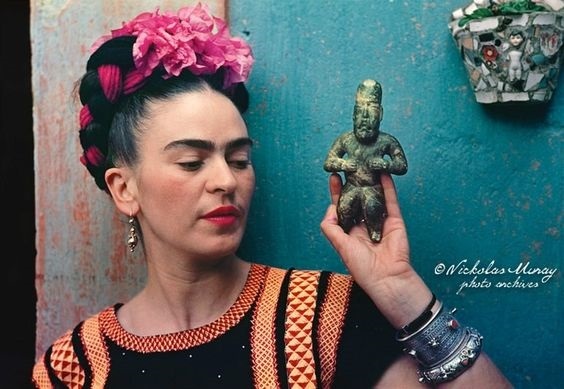 The retina wiggling, luminous blue colour of her home was one of the hardest things to recreate for Frida’s cactus-filled, art gallery showcase spread in Fantastically Great Women. I imagine her studio bathed in dusty Mexican sunshine, filled with scented flowering desert plants and alive with the chatter of her pet monkeys (not to mention yaps from the strange bald little Itzcuintli dogs she loved and her collection of vividly plumed exotic birds). 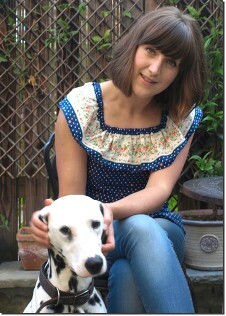 She was a lady who adored animals, colour and life. Frida was fascinating in lots of ways including being very good at living life to the full, even though hers was certainly not the easiest ride. Like her artwork and home Frida’s life was very ‘colourful’ to say the least. She proved the biggest challenge to present in an age appropriate way to readers. Her artwork was inspired by passionate and toxic love affairs, grief at the children she was unable to have and her battle with ill health after childhood disease and an accident left her with life limiting injuries. All quite full on stuff to interpret for Fantastically Great Women’s readership! Without wanting to gloss over the quirks and tragedies that made Frida one of the most intriguing women in the book I tried to draw out information about Frida and her artwork that young readers would identify with, like the fact that Frida herself was like an artwork. I could stare at photographs of her all day. Despite her problems she always looks so serene, her hair piled in crazy braided ribbon filled creations and wearing elaborate traditional Mexican dress. 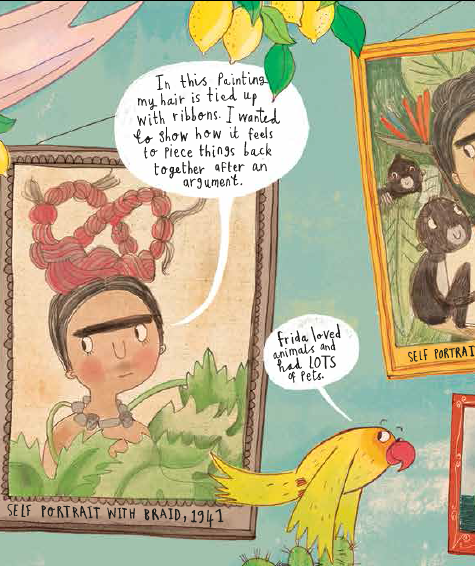 Frida’s appearance leads on to the question I thought many children would ask about her – why exactly did she exaggerate her facial hair in all her paintings?! Frida painted every detail in her artworks for a reason, so why the eyebrows and moustache? Women don’t usually present themselves in the beautifully honest way Frida did. The version of herself Frida presented refused to conform to traditional femininity, because who says femininity is about being plucked and preened from our natural selves? Not Frida. Her paintings were about being proud of who she was. That’s a great message for young girls and boys alike to tune into. When times get tricky, I’ll try to remember the words emblazed on a watermelon in Frida’s final artwork, painted from her sick bed – viva la vida! Long live life! Life is too short to worry about most things, most definitely including stray eyebrow hair. This is definitely a book to inspire young girls. It is already the No 1 Bestseller in History for Young Adults section of Amazon. RRP £6.99, but available on Amazon for £5.24. 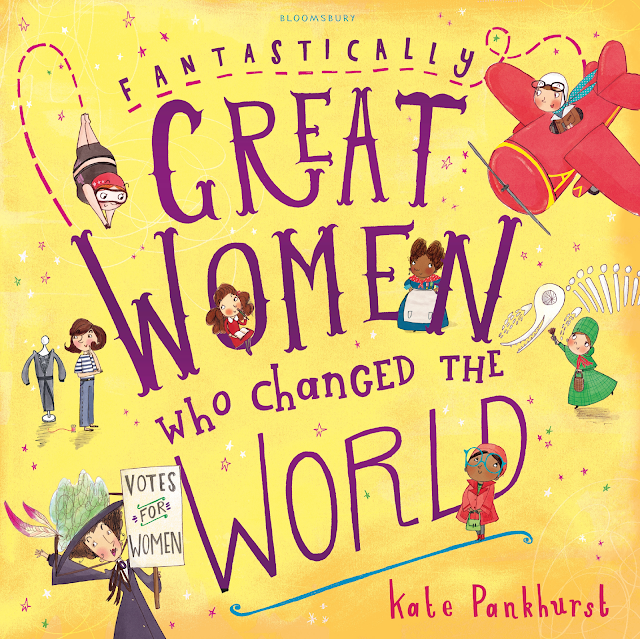 Fantastically Great Women Who Changed The World is published by Bloomsbury.